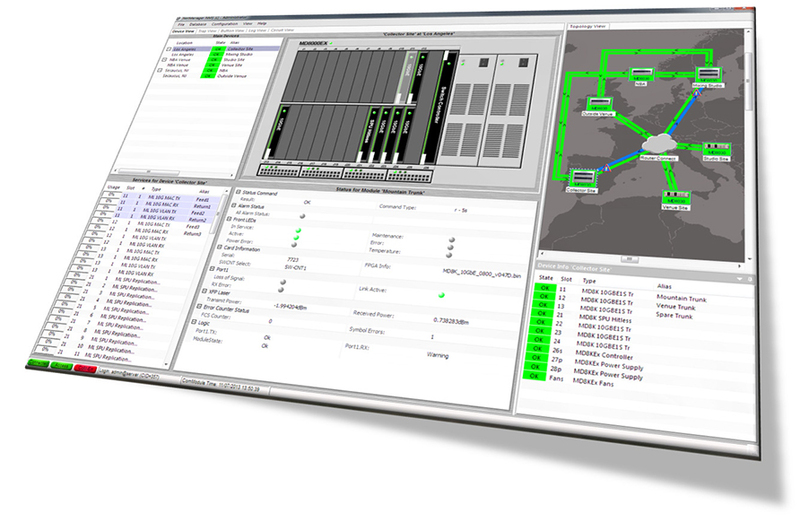 The ProMD EMS system provides real time monitoring and troubleshooting of network elements for media networks. ProMD EMS provides a graphical overview of all the elements and their status within a network. Its main focus is to provide operators with an easy to understand display, allowing rapid corrective action in the event of possible issues/alarms with a clear definition of different devices and their service purpose (such as video transmission). ProMD EMS is a based on a flexible XML architecture that allows for a highly customizable user interface and modeling of network elements. ProMD EMS comes with a user friendly XML modeling language and interpreter for the integration of new device types, new modules and for composition of the user interface. All variables of a device can easily be integrated or modified within the ProMD EMS GUI. The powerful integration scripts and macrocapability enables the end user to uniquely customize the application for their own special purpose. The ProMD EMS modules can be modeled into a tailored GUI for a concise and simple to understand view of the equipment, modules and services. ProMD full integration and network modeling services for design and implementation of user interfaces to exact customer requirements are available as options.